Summer has officially made its way into Las Vegas, and with it comes high temperatures. If you’re a Vegas local, you are no stranger to spending your days out in the triple digit temperatures. So if you’ll be visiting Las Vegas this summer, there is a high chance you will be spending most of your day at your hotel’s pool. While Downtown Las Vegas has quickly become a hotspot for tourists and locals alike, one thing that was missing for years was a cooling place to relax by a pool. The Downtown Grand has solved this problem with the opening of Citrus rooftop pool lounge. 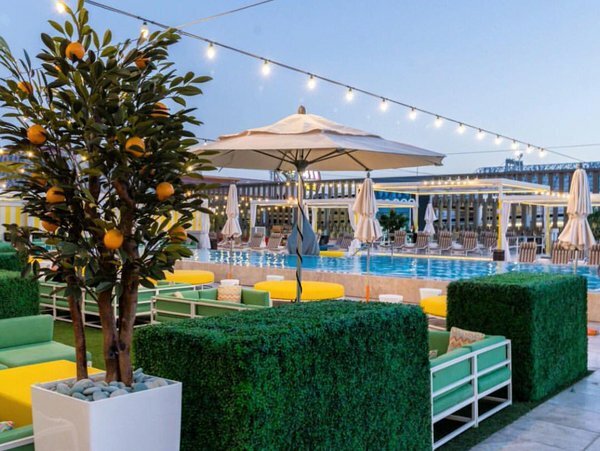 Before your Downtown Las Vegas bar crawl, head on up to the rooftop lounge inside of Downtown Grand for some time by the pool and taste some delicious cocktails. The Citrus is the perfect place to escape the Las Vegas heat. Sit poolside while the DJ spins the latest and greatest tunes. Enjoy some tasty bites and grilled items that will have you feeling like you are at a neighborhood block party. The 35,000 square foot pool deck makes it one of the largest pool lounges in Downtown Las Vegas. Hotel guests and visitors will be able to enjoy an infinity pool, private cabanas, full bar, dining, fire pits and a grass seating area with games and activities. Refreshing cocktails at The Citrus keep you cool in the sweltering heat. Be sure to try one of their fruit inspired drinks, like their twist on the classic Mule with ginger, basil, and lemon vodka, the 90 Miles Away (lime, mint, grapefruit and white rum) and Shake Me Cherry (marmalade, lime and cherry vodka). On top of all the delicious cocktails, you’ll have a selection of drafts including domestic favorites and some craft choices. Our Downtown Las Vegas bar crawls begin in the afternoon, allowing you plenty of time to soak up the sun by the pool and gear up for a great ride on the cycle. Don’t miss out on the only way to see all of DTLV in style. Book your bar crawl with Vegas Pub Crawler today.